A black and white copy of a traction engine towinga thresher machine. This photo os of Charles McKenzie's Fowler steam traction engine towinga thresher machine. Charles McKenzie owned 'Oakbank' at Diggers Rest and travelled the district working with the engine. A white paper receipt with black print and hand-written details. It is from W. W. Archer at the Orbost Club Hotel to R.P. Cameron, Shire President. It is for 12 dinners and has a blue stamp of the Orbost Club Hotel. This item is an example of early 20th century book-keeping in Orbost and is a useful research tool. These images are part of a series of eight photographs which document the construction of the Maroondah Dam in the 1920s. These photographs are invaluable in providing insight into many aspects of the Maroondah Reservoir’s early development. The dam wall is a distinctive example of early engineering techniques, with its gravity arch design and concrete construction. The construction of the dam wall represents an important advancement in the technology of dam-building. Words and phrases in Keerray Woorroong. A large dark blue flag with a faded isignia in the centre. 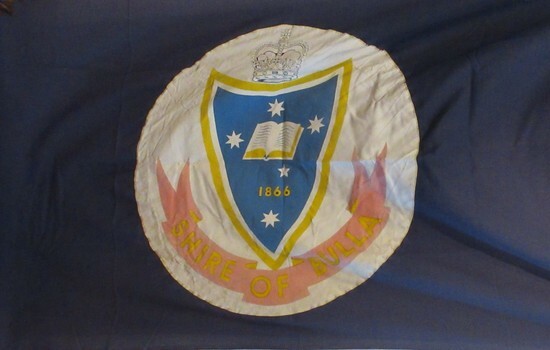 This flag with a Shire of Bulla insignia in the centre and was flown outside the Shire Offices in Sunbury. Real estate advertising leaflet, 1 folded sheet, printed in colour both sides. 7 Banfield Terrace Greensborough Four bedroom home, sold for $1,200,000 in December 2016. Previous sales, January 2007 for $240,00 and November 2004 for $220,000. The Murtoa RVIB Auxiliary was formed on May 8, 1932. This small collection contains correspondence to and from RVIB head office ranging between 1990 -2008 and also includes a brief history of the Auxiliary. B&W photograph. Image of houses. Mounted on board. Closest house is at the corner of Waverley Avenue and Rockbeare Grove. The house is still standing and is heritage listed. Inside - showing the Dining Hall. Photo showing the interior of the Dining Hall of the now completed building. The correspondent of the Argus on 10 May 1901 wrote: "The Parliament of the Commonwealth was opened yesterday by the Duke, of Cornwall and York, under a Commission signed by Queen Victoria and subsequently endorsed by King Edward VII. The ceremony was marked by the splendour and solemn impressiveness which befitted its historic importance. An immense assemblage of spectators, drawn mainly, of course, from this state, but in part also from each of the other federated states, and including representatives of other portions of the British Empire and of foreign powers, thronged the spacious, stately, and joyously decorated edifice. The picture was magnificent. It must have printed itself indelibly on the sensitive minds of the thousands of Australians who were privileged to behold it. We may assume that artists will reproduce it in worthy and imperishable forms, and that from generation to generation it will be familiar in the households of the Commonwealth. Our children's children, we may gladly say to-day, will not be ashamed of the function which inaugurated the self-governing rights of the southern British Nation. Nothing was omitted which could add to the grandeur and significance of the occasion. In a broad sense the proceedings were perfectly intelligible to the vast and sympathetic gathering, though the natural limits of a single human voice had to be accepted. The King's son, with his consort and the Governor-General and Lady Hopetoun by his side, and supported by the Governors of the states and other eminent personages, fulfilled his doubly-attested Commission with a simple dignity and a modest manliness altogether admirable. The ceremony was a brilliant spectacle, and, in its sentiment and suggestiveness, an inspiration to a loyal and patriotic people." The document design has artistic and aesthetic merit. While it is not rare, it is representative of the kinds of formal designs used for the Australian Commonwealth celebrations at the time of Federation, and is in excellent condition. Such items as this invitation have local, state and national historic significance as mementoes of a key moment in Australia's history. Locally, the invitation is part of a group of Federation-related items issued to James Maitland Campbell (and his wife). Campbell was three times mayor of Kew in the second half of the 19th Century and the owner of Ramornie in Pakington Street, one of the significant extant mansions in Kew. Front, printed. gold ink: "His Majesty's Ministers of State for the Commonwealth of Australia request the honour of the presence of / Mr & Mrs J. M. Campbell (handwritten) / In the Exhibition Building, Melbourne, on Thursday, 9th May, 1901, to witness / the Opening of the Parliament of the Commonwealth. / Edmund Barton / Prime Minister." Front, bottom left, printed: "The Young Queen / Her hand was still on her sword hilt - the spur was still on her heel ... (and further text) KIPLING'S COMMONWEALTH ODE." Page 9 of Ray Pearson's Photo Album. Brown card page with two photographs (landscape format) placed on page using clear plastic photo corners. Both photographs depict trams around Bendigo. Hand written inscriptions are located beneath each photo. The brown paper has some minor damage to top and bottom right corners from what appears to be the removal of adhesive photo corners. This work by Maryanne Coutts was undertaken during her Doctorate undertaken at the University of Ballarat (a predecessor of Federation University). Here thesis. 'Using narrative strategies in contemporary figurative painting', applies an analysis of narrative, its elements, strategies and devices to figurative painting within the practical project of producing visual narrative fiction. Maryanne COUTTS Maryanne Coutts studied at the Victorian College of the Arts (VCA), The University of Melbourne, 1979 -1981, the University of NSW (UNSW),1984 and achieved a PhD at Federation University Australia in 1999. She has exhibited extensively throughout Australia and internationally including UK, Spain and Thailand and is currently Head of Drawing at the National Art School, Sydney. Dr Maryanne Coutts was the first successful Visual Arts PhD from the Federation University Arts Academy. This item is part of the Federation University Art Collection. The Art Collection features over 1000 works and was listed as a 'Ballarat Treasure' in 2007. Black and white photograph of line of light horsemen formed up on edge or horse lines. Photograph is part of 20th Light Horse collection. The 20th Light Horse (Victorian Mounted Rifles) was raised in 1920 as part of the 3rd Cavalry Brigade, 2nd Cavalry Division, Citizen Military Forces, with Headquarters at Seymour and depots along the Goulburn Valley from Mansfield to Tocumwal in southern NSW. In December 1941, 20th Light Horse (Victorian Mounted Rifles) converted from horse to mechanised, initially as 20th Motor Regiment. In 1943 the Regiment was deployed to Merauke, Dutch New Guinea. Upon its return in April 1945, the Regiment was redesignated 20th Pioneer Battalion. It was disbanded following the end of the war. 20th Light Horse was the only light horse regiment to serve overseas in WWII. This is one of a collection of photographs featuring a Light Horse regiment drawn from rural and regional Victoria in the period immediately prior to mobilisation for World War 2 (1939-1945). Brief visit of the Major Mitchell Trail. This car based trail follows the route of the famous explorer right across Victoria. It crosses the Goulbum River near Chateau Tahbilk and Mitchelton Wineries and passes through Nagambie. Digital copy of black and white photograph. Photograph of the Greensborough Lower Oval in Main Street Greensborough opposite St Helena Road. The village of Greensborough can be seen In the background. An early view of Greensborough. This article encourages people to adopt a cat or kitten from the Cat Protection Society of Victoria in Elder Street Greensborough. Colour postcard with a scene of two monkeys, a pig and set of scales. One monkey is wearing a jockey's cap and carrying a saddle and whip. No message on back. From the album of WWI soldier William West (1268) of the 29 Infantry Battalion, 5th Pioneers Battalion. This collection of postcards, photographs and clippings were sent between William and his family and loved ones during the years he was on active service. See also 207 and 220. Front: "Gran'pop weighs in for the derby." Looking north from behind the Lower Plenty shops at Main Road and Para Road. This object relates to William David WILLIAMS. He was born on 23/05/1907 in Ballarat, VIC. William David served in the Army (VX139193 V103196) enlisting on, 10/05/1943 in Ballarat, VIC before being discharged from duties with the 2/9 FLD COY as a Army Non-Commissioned Sapper (SPR) on 30/01/1946. William David WILLIAMS was not a prisoner of war. His next of kin is W WILLIAMS. Written on back of photo - "Gunner Alf Madsen - Ben's old friend"
A small, rectangular, flat fridge magnet. One side is dark blue with white print - "K.B.& J.E. HEYNE Quality Butchers ORDERS TAKEN PRIVATE STOCK CUT & PACKED TO YOUR REQUIREMENTS Phone orders welcome Local DElivery No Charge 111 Nicholson St Orbost Ph 541921". The reverse is grey/black. Used as publicity/advertising item by Ken Heyne, butcher in Orbost. Fridge magnets are popular as promotional items because they are relatively cheap to manufacture, very portable and long-lasting. This item advertises a local business no longer operating.